Whether a Unsound Mind (Lunatic) person is Competent to Execute a Sale Deed ? Before :- V.K. Jhanji, J.
C.W.P. No. 6657 of 1991. D/d. 27.10.1998. For the Petitioners :- Mr. Viney Mittal, Sr. Advocate with Mr Arvind Bansal, Advocate. For the Respondents : - Mr. Harbhagwan Singh, Sr. Advocate with Mr. Arun Nehra, Mr. Ravindra Khandelwal, Mr. L.M. Gulati and Mr. Hittan Nehra, Advocates, and Mr. N.S. Bhinder, DA, Haryana. 1. 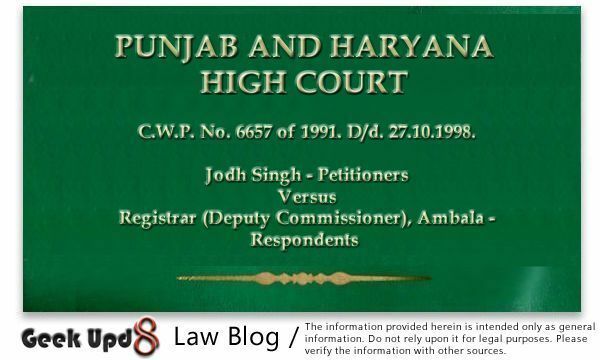 In this petition, challenge is to order dated 20.3.1991 passed by the Registrar (Deputy Commissioner), Ambala where by the Registrar in exercise of his powers under Section 68 of the Indian Registration Act has ordered cancellation of sale-deed dated" 15.2.1991 alleged to have been executed by Swaran Singh in favour of petitioners. 2. It is the case of the petitioners that Swaran Singh was owner of land measuring 234 Kanals 10 marlas situated in village Nauhni, Tehsil and District Ambala, vide registered sale-deed dated 15.2.1991, Swaran Singh sold his entire land for a consideration of Rs. 14,16,000/-. On 28.2.1991, Puran Singh (respondent No. 3) on his behalf and on behalf of Swaran Singh filed an application before the Registrar under Section 68 of the Indian Registration Act alleging therein that sale-deed executed by Swaran Singh is a void document because Swaran Singh was not competent to execute the same or sell his property being a person of unsound mind and an idiot from his very childhood. Upon notice of the application, petitioners by filing reply, denied the allegations. Petitioners contended that Swaran Singh was fully competent to execute the sale-deed and they are bonafide purchasers for consideration. Petitioners further contended that they had purchased the property after making necessary enquiry with regard to title of the vendor. Registrar vide order dated 203.1991 recorded a finding that Swaran Singh was of unsound mind and the sale-deed allegedly executed by him in favour of petitioners is simply a concoction. Registrar held that the Sub Registrar had no power to register a document purported to have been presented by a person of unsound mind. The sale-deed was thus, ordered to be cancelled. Hence, the present writ petition challenging the order of the Registrar on the ground that Registrar had no power under Section 68 of the Act to cancel the sale-deed registered by the Sub Registrar. 3. Learned counsel appearing on behalf of petitioners has contended that the powers of the Sub Registrar in registering a document presented to him for registration are absolute. It is contended that the Statute does not give any power to the Registrar to cancel registration of a document registered by the Sub Registrar. Against this, it is contended by the counsel appearing on behalf of contesting respondents that the powers vested under Section 35 of the Indian Registration Act was erroneously exercised by the Sub Registrar with the connivance of the petitioners and therefore, the Registrar in the facts and circumstances of this case rightly rectified the wrong done by the Sub Registrar. It is also contended that even if the order of the Registrar is held to be bad, then also it is not a fit case for exercising powers under Article 226 of the Constitution of India. It is contended that the order of the Registrar has done substantial justice and therefore, calls for no interference. 5. In 1960, Jagir Kaur, mother of Swaran Singh made an application to the District Judge, Ambala, under the Indian Lunancy Act for appointment of guardian and manager of the estate of lunatic, Swaran Singh. Her petition was contested by Puran Singh, Jagjit Singh, Hardial Singh sons of Hazara Singh on the ground that she being the natural guardian cannot be appointed guardian and manager of the estate of lunatic, Swaran Singh. The learned District Judge vide order dated 1.4.1982 dismissed the application filed by Puran Singh and others. The said Puran Singh and others filed an appeal in the High Court. During the pendency of appeal, Jagir Kaur died. On account of her death, the High Court ordered that appellant, Puran Singh and others may apply afresh for being appointed as guardian of the person and manager of the property of the lunatic. Puran Singh and others thereafter filed an application for inquisition under Section 62 of the Indian Lunancy Act before the District Judge, Ambala. On their application, notice was issued to the General Public, but none came forward to contest the petition. In the said proceedings. Dr. R.K. Patnaik, Senior Officer (Psychiatry), General Hospital, Ambala, deposed that from 29.1.1980 to 2.2.1980, Swaran Singh remained under his observation. He opined it to be a case of mental retardation as the person was unable to take care of himself being a man of unsound mind. Dr. S.C. Goyal, Civil Surgeon, deposed that while posted as Registrar, Medical College, Rohtak in May, 1980, Swaran Singh lunatic was found suffering from mental retardation. Swaran Singh was unable to take care of himself and his belongings without the help of others. The learned District Judge, Ambala, on the basis of evidence including the evidence of doctors, vide order dated 14.8.1984 recorded a finding that Swaran Singh is a person of unsound mind and is incapable of managing his property. Since the application for appointment of guardian and manager of the estate of lunatic was by 3 brothers who were undisputedly collaterals of the lunatic, the learned District Judge did not think it proper to appoint ail the three persons as guardian and manager of the person of the lunatic and ordered the appointment of Puran Singh, the eldest of all as guardian of the person and manager of his property Puran Singh who was appointed as guardian of the person of the lunatic and manager of the lunatic's estate, alone was competent to sell the land and that too with the permission of the Court. Section 75 of the Act empowers the manager to transfer the property with the permission of the Court. Proviso to Section 75 imposes a curb on the power of the manager to effect a sale. In this case, sale in favour of petitioners was not by the manager but by Swaran Singh who had been declared as a person of unsound mind. 6. In this background, the question to be considered is the competency of Swaran Singh to sell land vide registered sale-deed in favour of petitioners. 7. Section 7 of the Transfer of Property Act declares that every person competent to contract and entitled to transfer property can transfer the same to the extent and in the manner allowed and prescribed by law for the time being in force. Section 11 of the Indian Contract Act, 1872 lays down that every person is competent to contract who is of the age of majority according to law, to which he is subject and who is of sound mind and is not disqualified from contracting under any law to which he is subject. Section 12 of the Indian Contract Act deals with as to what is sound mind for the purpose of contracting. It says that a person is said to be of sound mind for the purpose of making 'contract' if at the time when he makes it he is capable of understanding it and for forming a rational judgment as to its effect upon his interests. It says that a person who is usually of unsound mind, but occasionally of sound mind, may make a contract when he is of sound mind. It also says that a person who is usually of sound mind but occasionally of unsound mind, may not make a contract when he is of unsound mind. "The Court will not recognise such a deed even by directing proceedings to be taken to try the question of its validity or to perpetuate testimony as to the state of the lunatic's mind when it was expected, but will treat the deed as entirely null and void." 9. In Machaima and Anr. v. Usman Beari, (1907)17 Madras Law Journal 78, sale-deed executed by the plaintiff when he was a lunatic, was held to be void under Section 11 of the Contract Act and it was said that defendant cannot rely on such a document in support of his title. Reliance in this regard was placed on the judgment in Mohori Bibee v. Dharmadas Ghose, I.LR. 30 Calcutta, 539 wherein the Privy Council made it perfectly clear that Section 11 should be literally construed. 10. In Subba Naicker v. Solaiappa Naicker, A.I.R. 1933 Madras 624, the learned Judge of the Madras High Court, followed the judgments in Marshall's and Re: Walker, (1905) 1 Ch. 160 and held that alienation by a lunatic even during lucid interval is null and void. 11. In Kamola Ram and Ors. v. Kaura Khan, 1912 Punjab Records, No. 41, Hon'ble Rattigan, J. speaking for the Bench opined that a contract entered into by a person of unsound mind being void under Section 12 of the Contract Act, the claim of the plaintiffs for refund of sums advanced to the defendant-lunatic is not entertainable and must fail." 12. It is thus, settled that once a person is disqualified from contracting being of unsound mind, a contract by him is void. In this case, Swaran Singh had been found to be lunatic by inquisition and therefore, he was not competent to sell the land in favour of petitioners. 13. The next question to be considered is as to whether Registrar had any power under the Indian Registration Act to cancel the sale-deed registered by the Sub Registrar. (c) if the person executing the document is dead and his representative or assign appears before the registering officer and admits the execution, the registering officer shall register the document as directed in Secs. 58 to 61, inclusive. (2) The' registering officer may, in order to satisfy himself that the persons appearing before him are the persons they represent themselves to be, or for any other purpose contemplated by this Act, examine any one present in his office. (b) if any such person appears to the registering officer to be a miner, an idiot, or a lunatic, or. Provided further that the State Government may, by notification in the Official Gazette, declare that any Sub-Registrar named in the notification shall, in respect of documents, the execution of which is denied, be deemed to be a Registrar for the purposes of this sub-section and of Part XII. 68. (1) Every Sub-Registrar shall perform the duties of his office under the superintendence and control of the Registrar in whose district the office of such Sub-Registrar is situate. (2) Every Registrar shall have authority to issue (whether on complaint or otherwise) any order consistent with this Act which he considers necessary in respect of any act or omission of any Sub-Registrar subordinate to him or in respect of the rectification of any error regarding the book or the office in which any document has been registered." 15. A bare perusal of Section 35 of the Act would show that the powers of the Sub Registrar in registering a document presented to him for registration are absolute. Sub-Registrar for the purpose of satisfying himself with regard to identity of the persons appearing before him or any other such purpose contemplated by the Act, is empowered to examine any person in his office and it is only where the person by whom document purported to be executed, denies its execution or if any such person appears to be minor, an idiot or a lunatic, he shall refuse to register the said document. The power conferred under Section 68 of the Act on the Registrar to exercise superintendence and control over the Sub Registrar is administrative. A Division Bench of the Lahore High Court in Hussain Ali Shah v. Sardar Ali Shah and Ors., A.I.R. 1933 Lahore 786, held that Section 68(2) of the Act does not confer upon the Registrar the power of cancelling the registration of a document, the execution of which is not denied and which has already been registered by Sub Registrar. In Nyadarsingh v. Chensingh, A.I.R. 1955 Madhya Bharat 205, the Division Bench relied on the judgment of Lahore High Court, and held that Section 68 only empowers the Registrar to issue directions to the Sub Registrars in respect of the their ministerial functions and duties. The section does not confer on the Registrar the power of cancelling registration of a document, the execution of which is not denied and which has been registered by the Sub Registrar. 16. In the light of the judgments referred to above, order dated 20.3.1991 of the Registrar cancelling the sale-deed cannot be sustained. However, taking that the Registrar had acted without jurisdiction in cancelling sale-deed, I do not think that in the facts and circumstances of this case I would be justified in issuing a writ of Certiorari quashing the order of the Registrar. A writ of Certiorari being a writ of discretion is issued on in cases where the order sought to be quashed has occasioned a failure of justice. It is not every error of law that would induce this Court to exercise extra-ordinary jurisdiction under Article 226 of the Constitution of India. In this case, I am satisfied that nothing has been done by the Registrar which could be said to have caused any injustice to the petitioners. Challenge to the order of Registrar thus fails. 17. During the course of hearing, it has been brought to my notice that FIR No. 107 of 1991, P.S. Ambala City, was registered against the petitioners under Sections 467, 419, 471, 120-B, IPC. and 81 and 82 of the Registration Act, and the challan was put in against the petitioners but the Court seized of the matter has not taken any proceedings because operation of the order of the Registrar had been stayed by the Motion Bench. Since the writ petition is now being dismissed, the Court seized of the criminal case, is directed to conclude the proceedings in the said case expeditiously. Petitioners who have come in possession of the land on the basis of sale-deed dated 15.2.1991 are directed to restore possession of the land in their possession to the legal heirs of Swaran Singh, who in law have become entitled to the estate of the lunatic on his death. 18. Resultantly, the writ petition shall stand dismissed. No costs. Geek Upd8 - Law Reporter: Whether a Unsound Mind (Lunatic) person is Competent to Execute a Sale Deed ?